Dutch painter, member of a family of painters of Flemish origin (spelled also Meytens; Mytens). He was nephew of Daniel Mijtens I. He was the son of Daniels elder brother David, a saddle-maker in The Hague. Daniel Mijtens I was a portrait painter in England in the Stuart court, Martin Mijtens I was a portrait painter in Stockholm; his son Martin van Meytens II later became a portrait painter at the imperial court in Vienna. Jan may have learnt to paint from his uncle Isaac Mijtens. After 1634 he may have trained with his uncle Daniel, who had by then returned to The Hague; Jan married Daniels daughter Anna in 1642. In 1639 he had been admitted to The Hagues guild of painters, of which he became a governor in 1656. 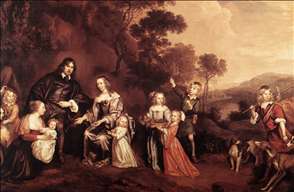 In the latter year he helped to found the painters society De Pictura; from 1667-8 he was a governor of this society and from 1669-70 its dean. 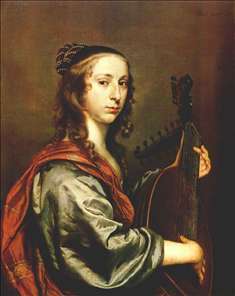 See more details about "The Family of Willem Van Der Does"
See more details about "Lady Playing the Lute"